TORONTO (AP) -When mild-mannered Matt Stajan kicked a sock across the Maple Leafs dressing room, you knew this wasn't your run-of-the-mill loss. This one stung. The players wouldn't say it, but Toronto's 6-2 loss to the Boston Bruins on Tuesday night very much felt like the last game of the year. At least the last game that mattered. "That's a tough one," Stajan said. "You get behind that team and they just clog up the neutral zone and you find yourself doing things you shouldn't be doing like turning pucks over. " Marco Sturm and rookie David Krejci each had a goal and an assist for Boston. Jeremy Reich, Phil Kessel, Shawn Thornton and Glen Murray also scored for the Bruins, who maintained their hold on the eighth and final playoff spot in the Eastern Conference and improved to 86 points. Boston is six points ahead of the Leafs with five games left to play for Toronto. The best the Leafs can get to is 90 points. "I don't feel that at all," protested Leafs winger Alexei Ponikarovsky when asked if his team's season was over. "We have another five games and we'll keep battling for it." Coach Paul Maurice pulled goalie Vesa Toskala with 3:18 to play in the third period and his team down three goals. Alexei Ponikarovsky and Jason Blake scored for the Leafs, who head to Boston on Thursday. The Leafs had gone 12-4-1 in their past 17 games entering Tuesday. Both clubs were without their leading scorers. Bruins playmaker Marc Savard was out with a back injury after being cross-checked by Montreal's Steve Begin on Saturday night. Leafs captain Mats Sundin missed his fifth straight game with a groin injury. The Leafs had gone 3-1 without their star center. The Bruins responded with one of their best efforts in nearly a month. And that's despite playing short-handed for most of the game after losing 22-goal scorer Chuck Kobasew to a leg injury early in the first period. "I can't say enough about the guys tonight - especially after losing Kobasew early like that," Julien said. "Guys really stepped up." Matt Lashoff opened the scoring with a point shot that deflected off Murray and went past Toskala just 3:57 into the game. Krejci made it 2-0 only 1:12 into the second period, backhanding a rebound past Toskala off a Sturm shot. Krejci then returned the favor at 8:20, spotting Sturm at the side of the net with a perfect cross-ice pass on a power play. That gave the Bruins a 3-0 lead. Pavel Kubina bounced a pass off Blake and past goalie Tim Thomas with 4:30 left in the second period to make it 3-1. Thornton then made it 4-1 early in the third period. Ponikarovsky slid home a shot from the slot with 5:16 left to make it 4-2. Kessel restored the three-goal lead on a one-timer with 3:44 remaining. Reich scored into an empty net to complete the scoring at 19:43. Notes: Forward Boyd Devereaux made his return to the Leafs lineup after missing 15 games with a knee injury. The Leafs reassigned forward Alex Foster to the AHL Marlies ... 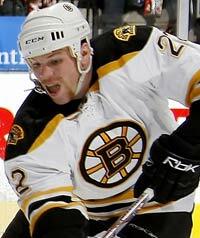 The Bruins were also missing defensemen Andrew Ference (leg), Andrew Alberts (concussion) and Bobby Allen (back). Star center Patrice Bergeron has been out since October a concussion. ... The Leafs were also missing second-leading scorer Nik Antropov (knee) as well as forward John Pohl (ankle) and defenseman Carlo Colaiacovo (hamstring).